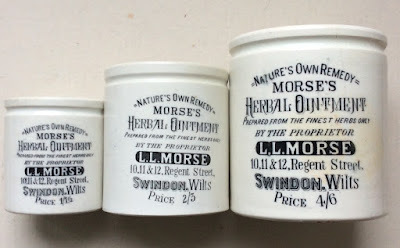 This page shows the 'Morse's' ointment pots originating from Swindon in Wiltshire. Levi Lapper Morse was a well known and successful businessman based in Swindon dabbling in different forms of business from grocery to drapery, and furniture dealing. In 1907 he was listed in the Kelly's directory as being both a J.P. and a M.P. 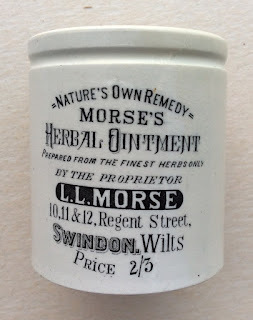 Somewhere along the line, Levi Morse became involved in producing a herbal ointment, branded as Natures Own Remedy, and this product was sold in pots of three sizes with prices listed as 1/1½, 2/9 and 4/6. In the BBR magazine no.110 there is an interesting arcticle entitled "Morse Code" regarding these pots which originate from Wiltshire and also refers to the existence of a rare pot lid. 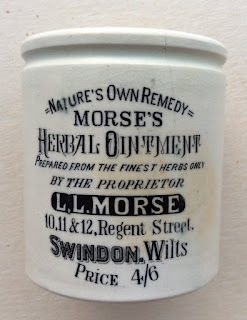 The black & white pot lid shows that the Morse's Herbal Ointment product was sold with prices of 2s 3d and 4s 6d and also states that the ointment was prepared by the Proprietor Stratton, Swindon, Wilts. 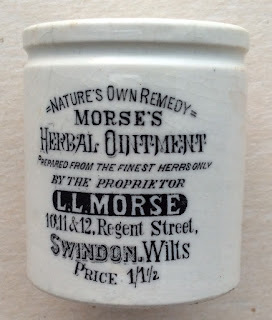 Further detailed information regarding the Morse's Herbal Ointment can be obtained from the Historical Guide to Delftware and Victorian Ointment Pots book produced by Messrs. Houghton & Priestley, page 106.